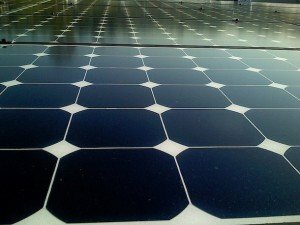 What Can I Use Solar Panels For? Today, solar powered items are cheaper than ever before and provide clean, renewable energy that can save you money each month — which adds up immensely over years of homeownership. Not to mention, making green improvements to your home can earn you tax benefits year over year. I understand that switching to solar power overnight doesn’t seem realistic, and it isn’t for many of us. However, when you’re a homeowner, things break from time to time, but luckily we have choices when ordering repairs and new equipment for our homes. If you’re looking for a new water heater, air conditioning unit, or heater, think about going solar instead. Of course, most of us know that solar panels convert light into energy, but how exactly does it work? Solar panels are made up of light sensitive cells (photovoltaic cells). When light hits these cells, they produce energy (direct current). That current is then channeled into a converter that helps change the direct current into alternating current, which is what powers all of our stuff. After the current is converted, it flows through a meter, which measures how much power your panels are making and how much you are using (you’ve probably already seen an electricity meter on your home). Once it travels through the meter, it’s ready to use! It works exactly the same way as regular power does. Have an outdoor pool? With a simple “solar blanket” you can keep your pool at a comfortable temperature all year long without having to use heaps of electricity. Solar blankets require very little installation and simply emit heat from the sun into your pool as it is collected from the rays. You can even look into entire pool heating units that work the same as a traditional pool warmer, but are powered by solar panels instead. This usually offers a little bit more of a punch and will give you more consistent water temperatures throughout the year. In addition to pool heating, you can use a very similar setup to heat the water in your home. It works just the same way that a traditional water heater does, just with solar power. Solar power is quite efficient at heating water. So, you can expect it to both work quickly and use much less power than a traditional water heater. While installing an entire solar panel array on the roof to accommodate all of your indoor and outdoor power needs would be great, not all of us can afford to do this. If you’re not quite ready to make that jump, you can pick a smaller panel instead. You can actually choose a small kit that allows you to use solar power for lighting your home. You can divert energy to the light switches in your house so they pick up the solar power first. Another option is to use solar power for just your appliances that use up a little bit more energy than you would like. The choice is yours where you want the energy to go. Lastly, you’ve probably seen solar powered lights for your lawn and garden. Why buy expensive outdoor lighting when you can get it for free from the sun? We all know that keeping a home warm during the coldest months of the year can be expensive. Instead, think about switching away from your old gas heater or change your electric heater to a solar powered unit. You’ll be amazed at just how much money you can save over the winter months. If you’d rather supplement your heating needs instead of completely switching over, you can look into portable solar powered heaters. Just like space heaters, you can move these units all over your house to give you a burst of heat wherever you need it. If you’re staying to one room of the house, you might never need to turn your heat on at all! If you are dedicated to the cause, there’s no better time to go entirely solar. It’s easier and cheaper than ever to buy your own “solar kits” that can be attached to roofing or wherever you get the most sun. Or, if you feel more comfortable, you can have a professional come install the panels for you. You’d be surprised how powerful solar energy can be. Solar energy can power everything in your home that traditional power does. If you’re wondering, “what do I do when there is no sun?” don’t worry! Solar powered units can be installed in a way that won’t disrupt your power usage. If there is no solar power to be had, your traditional power supply will kick right in. You can also go with a backup generator for those power emergency instances as well. Switching anything in your home to solar power will save you money and you can rest assured knowing your energy source is a renewable one. Go solar!